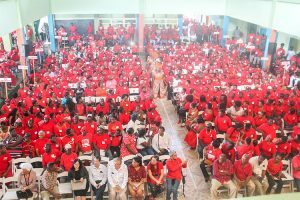 Members of the Unity Labour Party (ULP) during the convention on Sunday. 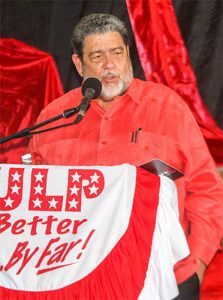 Prime Minister Dr Ralph Gonsalves was unsurprisingly returned as political leader of the Unity Labour Party (ULP) at the party’s 23rd national convention held last Sunday at the Campden Park Secondary School (CPSS). But even before the delegates voted that Gonsalves continue to lead the party that has been in government for almost 18 years, persons gathered at the CPSS suspected that no change to the party’s hierarchy would happen that day. In his welcome remarks, Edwin Snagg, Chairman of the ULP jokingly called on Eloise Gonsalves, wife of the political leader to lend the party her husband for a little while longer. “…I know that women does want their husband,… but you see, you married to a man with a mission… Mrs Gonsalves the people … ask that you lend him to us for yet a little while longer,” commented Snagg, who was himself returned as Chairman. Snagg, addressing a hall with over 500 persons inside while more listened on the outside, thanked Gonsalves for his vision, sacrifices and wisdom in leading the country. “We are here because we believe in this party, we believe in the governance that is given by the ULP administration, we believe that it is best for St Vincent and the Grenadines, that it is best for us and best for our children and it is best for our children’s children,” Snagg said. He commented that a few months ago, an opposition senator Kay Bacchus-Baptiste during a swearing in ceremony in Parliament said that she is there to set the captives free but to his knowledge this country has no captives. “There are no captives in St Vincent and the Grenadines, the people have already liberated themselves on March 28th, 2001 when they took the New Democratic Party from off their necks. There is total freedom here in St Vincent and the Grenadines,” Snagg said to loud applause while noting that they are hoping that Gonsalves leads the party into another election. Snagg, the ULP’s caretaker of the Southern Grenadines seat, said General Elections will be held when the Prime Minister chooses and the people want Gonsalves to lead them for another time. “…We are confident of the victory of good over evil, NDP ain’t going win no election here,” said Snagg, quoting from Robert Nesta Marley’s song “War” which was inspired by Haile Selassie’s 1963 address to the United Nations (UN) General Assembly. Introducing Gonsalves, Deputy Chairman of the ULP Rochelle Forde-Duncan, who was also returned to the post during the closed voting session, said the ULP has confidence in Gonsalves as he is a great leader. “The Prime Minister has shown confidence in young people and has taken care of the elderly and given us housing. “He has taken care of us in terms of education. We have had improvements in tourism, how many cruise ships you see coming in? Is everyday cruise ship after cruise ship,” Forde-Duncan commented. “Dr Gonsalves loves people, he loves St Vincent and the Grenadines, he loves each and every one of us he believes in us and likewise we believe in him,” commented Forde-Duncan. The convention was held under the theme, “Preparing the way, five in a row” and was attended by members of the diplomatic corps, former and serving parliamentarians and party supporters from throughout the length and breadth of the country. During the proceedings, a moment of silence was held for persons who had passed away, but in their lifetime gave “yeomen” service to the ULP. Entertainment was provided by a dance group from Union Island. Gonsalves took part in the presentation which went down well with the gathering. The closed voting session also saw Sir Louis Straker being returned as deputy political leader of the ULP.